The unusual scheduling of September's last weekend for the Indianapolis Symphony Orchestra presumably helped swell the crowd for Saturday's concert in the Hilbert Circle Theatre. It was the only performance of the full program in its home: Thursday morning's curtain-raiser omitted Beethoven's "Coriolan" Overture, and the full program will be repeated only once. Lucky folks Sunday afternoon at Avon High School, if that concert in the ISO's new "317 Series" goes as well as this one did! It was a treat finally to hear Shai Wosner in concert. Among the deprivations of the shortened season in 2012-13 was the cancelllation of Wosner's ISO debut almost exactly two years ago, the victim of the lockout of musicians during contentious contract negotiations. He's on hand this weekend to play Mozart's Concerto No. 20 in D minor, K. 466. From the first solo entrance in the first movement, you could witness a portrait of true concerto partnership being committed to canvas. I would judge the dynamic level to be mezzo piano, and it worked perfectly to establish a mood of interaction with the orchestra. On display was a consistent preromantic conception of the solo concerto — totally fitting despite the protoromantic nature of the work, the 19th century's favorite among Mozart's 27 piano concertos. I've been waiting two years to hear Shai Wosner with the ISO. The use of Beethoven's cadenzas, as well as scrupulously detailed mutterings of anxiety that launch the work and such later turmoil as the fast middle section of the Romanza, ensured that the interpretation would not lean toward rococo style to the slightest degree. How much Mozart's melodies owe to singing should never be scanted, and Wosner capably played that second-movement tune with aria phrasing and a singer's tone. Coordination between soloist and conductor Krzysztof Urbanski was exemplary throughout. Especially well-judged was the orderly slowing of tempo from the Romanza's pattering episode in the second movement back to the main section. For an encore, Wosner played Schubert's "Hungarian Melody" with haunting lyricism and a feeling for color that included evoking the instrument of Hungary, the cimbalom, in a way familiar from Zoltan Kodaly's "Hary Janos" Suite. Urbanski and the ISO opened the concert with a powerful reading of the "Coriolan" Overture. The contrasts between masculine and feminine elements of the story of the stubborn, vindictive Roman general Coriolanus were placed implacably in the foreground. Beethoven had an uneasy relationship with theater, but was a natural dramatist when he could pose abstract human qualities against each other. This performance captured that quality. Marketing for these concerts emphasized the encounter of Urbanski and Brahms 4, and that kind of highlighting proved to be apt. Saturday's performance of Brahms' Symphony No. 4 in E minor had breadth and grandeur. Urbanski drew consistent sostenuto phrasing from the orchestra, without allowing a fondness for linked phrases to impair the momentum. Even the trenchant passages in the first movement were well-integrated. Pretty much the usual midpoint of Urbanski's hand position. The slow movement was given an affectionate cast, and trimly played except for a few impure horn entrances. Urbanski brought out a playful mood throughout the third movement, with especially delectable woodwind curls placed around buoyant string figures. For the finale, he elicited from the ISO a distinct character to each variation upon the short repeated theme in the bass (the classic passacaglia form). The orchestra responded by putting forward some of the most transparent scoring to be found in Brahms, on a par with that perennial charmer, the Variations on a Theme by Haydn. The totality amounted to a structure of immense expressive range and rhetorical panache. From my seat near the front but more off to the right of the podium than usual, I had ample opportunity to appreciate Urbanski's technique. It occurred to me that among the advantages of conducting everything from memory is the naturalness of his baton's high position throughout. 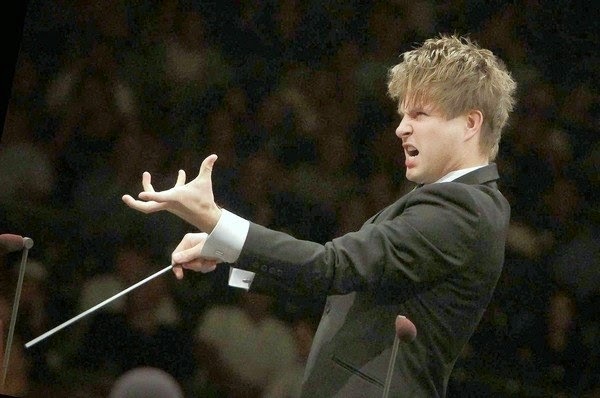 Unlike hockey, there are no penalties in symphonic conducting for high-sticking (there are also far fewer fistfights). In fact, there may be significant payoffs — visibility, clarity, rhythmic precision —from keeping the baton high. I'm estimating that Urbanski's stick is at least shoulder-high 65 percent of the time, chest-high 25 percent, waist-high only about 10 percent. It might be compared to an opera role's tessitura and the voice most suited to it. If only there were a way to compare conductors' comfort zones for their craft. And I'm betting that Urbanski's physical tessitura is higher than most of his colleagues'. It would be interesting to get comparative videos, because I'm guessing that having the score in front of you means your head and arms necessarily make of the music stand a reference point, no matter how well you know the score. I'm also impressed with how much dynamic variety he draws from the orchestra standing straight up. Many otherwise competent conductors crouch when they want to lower the volume suddenly: Kelly Corcoran, the able guest conductor brought in by the Indianapolis Chamber Orchestra Friday night at the Schrott Center, is a croucher. So is the revered former ISO music director Mario Venzago. I tend to suspect crouchers of mere showmanship, but maybe they also crouch in rehearsal, where showmanship is quite beside the point. Orchestra musicians will have to let me know.